Though it may sound like something related to Halloween, it addresses something far more scary. 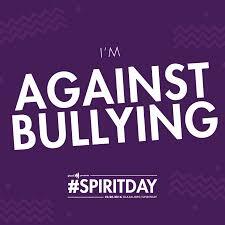 According to GLAAD, Spirit Day is celebrated to speak out against LGBTQ bullying and to stand with LGBTQ youth. They disproportionately face bullying and harassment because of their identities. Pledging to "go purple" on Spirit Day is a way for everyone -- forward-thinking companies, global leaders, respected celebrities, neighbors, parents, classmates, and friends -- to visibly show solidarity with LGBTQ youth and to take part in the largest, most visible anti-bullying campaign in the world. Spirit Day is observed on the third Thursday in October. Started in 2010 by Canadian teenager Brittany McMillan, it was initially created in response to a rash of widely publicized bullying-related suicides of gay school students in 2010, including that of Tyler Clementi. The name "Spirit Day" comes from the purple stripe of the Rainbow flag, whose creator Gilbert Baker defined it as "representing 'spirit.'" Also, watch the excellent video below from Burger King.